I’ve absolutely no idea whether Student B was being funny, ironic or genuine, but the comment stuck with me. It made me laugh. Yesterday, as I was filming a workshop hosted by CAIPE (Centre for the Advancement of Interprofessional Education) at which TIGER was present, I noticed a participant using an iPad placed firmly in a keyboard dock. I asked her after the meeting why she used the keyboard and whether it was because it helped her type faster. She said it did, but her main reason – as with the comment of the student above – made me do a mental double-take. 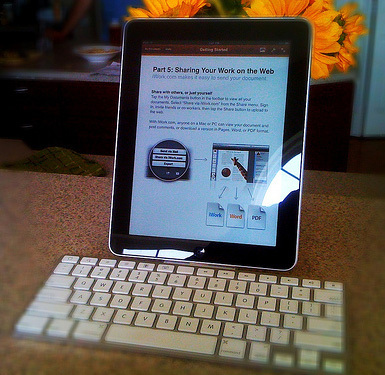 It was that using a keyboard prevented her iPad screen from becoming ‘dirty and smudged with fingerprints’. I find this fascinating, as for me this is equivalent to strapping a team of horses to the front of a car because it prevents the exhaust pipe from getting sooty. However, for this person, the system clearly works. So perhaps for her the touch screen capabilities of the iPad are not the most important features, as they clearly are for me. Perhaps the lightness, portability and quick launch features of the device are more important. I think my preconceptions were challenged in both cases, which is never a bad thing, and particularly so when it comes to technology. What happens across the pond can give us food for thought. The American Society for Training & Development(ASTD) surveys annually the state of the learning and development industry in that country. According to a summary of ASTD’s 2010 report , the industry continued to grow in 2009 compared with 2008. The sum spent on training by companies per employee was still rising, even in the recession. More than a third of all learning was delivered or facilitated electronically. Nearly a third was delivered online. Each hour of learning content was re-used about 60 times, compared with about 45 times in 2007. It sounds positive, from an e-learning point of view. In the UK, Towards Maturity, a group that promotes learning technologies at work, conducts similar surveys. In its 2010 report is an analysis of what 400 organisations (including a third from the public sector) were doing to ‘deliver business results’ with learning technology. In the top quartile, three-quarters of their staff used e-learning. Compared with traditional methods, e-learning saved 21% in costs, 27% in study time and moved from idea/need to delivery 32% faster. Positive again. Brian Chapman, who runs his own e-learning company in Utah, surveyed 249 organisations (including a few universities), asking how long it took them to develop e-learning . A simple 1-hour unit (content and questions) took on average 79 hours to design, develop and test, at a cost of about £10K. It cost more to include greater interactivity and multi-media. Surveys like these seem to provide great hope for learning technologists looking for jobs in difficult times! But all three were published by parties with a vested interest in promoting e-learning. Is there a bias in their statistics? The Beyond Distance Research Alliance (BDRA) is modest in its approach to using statistics. With its collaborators in projects like TIGER and OSTRICH that focus on quality in online open educational resources, Beyond Distance aims to develop mutually beneficial procedures and OERs, rather than headline-grabbing statistics. At last week’s TIGER Steering Group meeting at the University of Northampton, I was impressed by the dedication and professionalism of staff at De Montfort, Leicester and Northampton, and by their attention to detail. Recently I had the opportunity to spend a day with our TIGER (see note below for a description) project partners at the University of Northampton. I took part in their course development event. Our Northampton Tigers are currently developing teaching and learning resources that can be released as OERs (Open Educational Resources) for the benefit of the wider academic and practitioner community. The subject area covered within the TIGER project is Interprofessional Education (IPE) – a Higher Education level programme of studies undertaken by professionals that you and I meet when we are in need of health and other forms of care (nurses, care professionals, paramedics – just to name a few). The focus of Interprofessional Education is for these different professionals to learn about each other’s roles and develop efective collaborative practices. I observed many interesting aspects of course development that were unique to developing OERs and especially for OERs for Interprofessional Studies. An obvious, but often under-rated point that needs due attention is that developing OERs is a much more complex and sophisticated process than that used in developing course material for distance and e-learning. This is especially the case, as Northampton Tigers showed me, in a subject area such as IPE where the course development team includes both interprofessional academics from universities and practicing professionals from hospitals and other communities gathering together to develop a set of teaching resources that are relevant for both national and international academic and practitioner communities. Copyright issues and ethical considerations of using images and other media are just two of the many aspects to consider in OER development. As we are involved in the TIGER project in the next coming months, we will be able to report on the actual processes involved in developing OERs from scratch and from existing traditional e-learning courses. So, watch this space! Meanwhile you can visit the project website at http://www.northampton.ac.uk/tiger to learn more about it…. Note: TIGER (Transforming Interprofessional Groups through Educational Resources) is an Open Educational Research project funded by the UK Joint Information Systems Committee and led by the University of Northapmton in partnership with De Montfort and Leicester Universities. Yesterday 19 January was the Programme Meeting for the OER Phase 2 projects in Birmingham. At Beyond Distance, we are participating in TIGER (new release project) and OSTRICH (cascade project). David White (Oxford) on how OERs are being used – an interesting diagram available from his project blog, not too different from a 2×2 matrix currently being developed by OSTRICH. ‘Evaluation’. At BDRA, over the years, we have taken the view that in order to generate robust evidence that academics and others in the Higher Education sector can relate to, you need research. ‘Evaluation’ is useful and sometimes appropriate, but to foster meaningful and evidence-based change, you need more than that. The collection, analysis and presentation of research evidence (beyond sets of interesting quotations) may help to provide answers to the many questions we discussed (e.g. practice change, development and release, organisational and cultural issues, impact). Some of the questions overlap with TIGER’s research questions. It is no coincidence that the TIGER project has a full-time researcher in the team – this is precisely to generate robust and reliable evidence. Innovative platforms for OERs, which perform highly visible marketing and a T&L functions, such as iTunesU. 30 million downloads of the Open University’s iTunesU resources, 2.5 million of Coventry’s in 2010 alone. We discussed how some HE Marketing Departments do not seem to realise the power of these platforms and the OERs on them. Even a relatively small presence, consisting of some frankly tedious resources, are of significant value to many prospective students, at a marginal cost to the university. Single project repositories for OERs, as opposed to institutional, branded repositories. Are we saving or wasting our time by having ‘sanitised’, project repositories? Will institutions use these repositories after the end of the projects or will they generate their own fully branded ones? A lot of ideas to think about as our projects develop. This new year sees a number of changes in Beyond Distance, the most significant being the departure of Gilly to take up her new post as Professor of Learning Futures and Executive Director of the Australian Digital Futures Institute at University of Southern Queensland. While we are sorry to see Gilly go, one silver lining to this particular cloud is the collaboration now underway between our two institutions on the Learning Futures Festival Online 2011, Follow the Sun. With its non-stop, 48-hour, global format, I’m certain this conference will further cement the institutions’ reputations as technology innovators. Beyond Distance also continues its main work of researching new technologies and pedagogies. Just yesterday, a research pilot project called PELICANS was placed in the Breeding Area of the Media Zoo, and existing projects CALF, SPIDER, SWIFT, OSTRICH and TIGER progress well. The Media Zoo continues to disseminate colleagues’ research and, importantly for University of Leicester colleagues, offer hands-on technical advice. The Friday Workshop, a new series of learning technology workshops held every Friday morning 10-12, has just been launched. Our own Media Zoo will also be collaborating more with the Graduate School Media Zoo (based in the library on the main campus). With its focus on postgraduate students, the GSMZ offers us a chance to bring academics and PhD students together in a single environment to learn as much from each other as from the Zookeepers. I’m always amazed by the achievements and knowledge of my colleagues, so I remain certain that 2011 will see everyone build upon Gilly’s hard work to keep Beyond Distance at the forefront of e-learning research in higher education. As part of the TIGER research, I observed a practical training session at Loughborough Hospital last Monday and Tuesday (8-9 Nov 2010). 15 students studying different subjects: Medicine, Nursing, Pharmacy and Social Work, most of them in their final year, took part in the training about Interprofessional Working (IPW). The students were put into four groups, 3-4 students in each group, to work together throughout the 4-day event. The training featured different practical activities, including a group-based case study in which students learn about discharge policy, process and care package for an elderly patient, a group presentation based on their case study, presentations and discussions led by practitioners and experts in different fields, and an simulation regarding elderly patients. Their access is restricted to limited medical websites and databases due to the hospital’s firewall. Small hospitals may not have facilities such as a library for students and staff to access the internet and resources. Students on work placement are very busy. They generally think that they have no time to access any kind of materials or resources. No student brought a laptop with them to the training. Some have iPhones or smartphones which they use to access the internet. Accessibility is absolutely essential in the TIGER project. I could see the potential of making OERs in mobile format to increase students’ accessibility to learning materials and resources while on work placement. However, there is an issue with using mobile phones in hospitals as the NHS does not encourage staff to use mobile devices to access the internet at work. There is a cultural barrier which needs addressing. There is already a movement of increasing use of mobile devices in medical contexts. Medical students at Leeds University are given iPhones as part of their study. In their final two years, medical students spend much of their time in hospitals, GP surgeries and clinics. iPhones give them the opportunity to stay in contact with the tutors, course materials and textbooks. Another example is the Sarasota, Florida Memorial Healthcare System which gives nurses iTouch and iPhones to communicate and stay connected. Three animals joined the Media Zoo this year: TIGER, OSTRICH and SPIDER. All three projects are to do with Open Educational Resources (OERs). In TIGER (Transforming Interprofessional Groups through Educational Resources) three institutions: the University of Northampton, De Montfort University, and the University of Leicester work collaboratively to develop, create and release reusable and customisable OERs for Interprofessional Education (IPE) in Health and Social Care. TIGER will evaluate the impact of OERs on academics and students of three institutions, and IPE practitioners working in hospitals. I’m about to take my first step into TIGER research. From next week, there is an opportunity for me to observe some face-to-face teaching sessions that introduce students into Interprofessional working at Leicester. Also next week, there is an opportunity for me to visit a local hospital where medical students join students from nursing, social work, and speech and language therapy from Leicester University to attend a 4-day Interprofessional Education programme. The students will be placed in small groups to learn together in ward for care of the elderly. They will explore the roles and responsibilities of each profession relating to care planning. These events will help me understand the current teaching practice in IPE. They will also provide opportunities to identify how OERs can be used to influence the current practice and support student practical-based learning in workplace. What do a TIGER and an OSTRICH have in common? As mentioned by Ale last week, the Beyond Distance Research Alliance at the University of Leicester has received further funding from JISC and the HEA to continue spearheading the creation and release of learning materials as open educational resources (OERs) via the OSTRICH (OER Sustainability through Teaching & Research Innovation: Cascading across HEIs) project. There is also the TIGER (Transforming Interprofessional Groups through Educational Resources) project – more about that below. Beyond Distance established a reputation for its work in OERs through the OTTER (Open, Transferable, Technology-enhanced Educational Resources) project from May 2009 to April 2010, in which over 430 credits’ worth of learning materials were published as OERs, in 13 subject areas ranging from Politics through Law to Genetics. (See www.le.ac.uk/oer.) A major outcome of the OTTER project was a workflow and quality framework called CORRE, which includes step-by-step procedures for ensuring that there is no breach of third-party copyright, and transforming and formatting materials to make them reusable and customisable by other academics and students in different contexts. Beyond Distance is now leading the way for other institutions to apply the knowledge gained from piloting CORRE at the University of Leicester during the OTTER project. 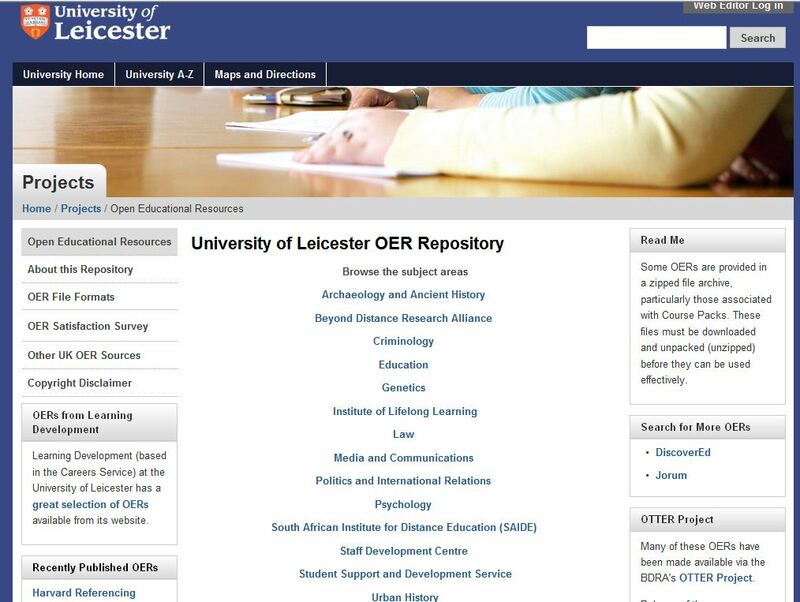 In the OSTRICH project, the University of Leicester is supporting the Universities of Bath and Derby in creating and publishing at least 100 credits’ worth of OERs each, in a range of subject areas, following procedures based on the CORRE framework from OTTER. The OSTRICH project is also developing and testing a model for cascading knowledge about OERs and OER processes, enabling other higher education institutions to gain from the knowledge learnt during OTTER. Apart from the OERs themselves, all workflow templates and draft policy guidelines produced in the project will be made available for other institutions to customise to their contexts. TIGER is a collaborative project between the University of Northampton, De Montfort University (DMU) and the University of Leicester, and will release teaching resources amounting to at least 360 credits into Jorum Open, the main repository for UK Higher Education, and TIGER’s own repository. The three institutions will collect, develop and share OERs designed for Interprofessional Education (IPE) in Health and Social Care. IPE is an emerging field within Health and Social Care curricula, in which students learn about each others’ professional practice to enable more effective collaboration and improve health outcomes. The TIGER project aims to dramatically benefit IPE in Health and Social Care and to solve ongoing challenges in cross-professional collaboration. TIGER OERs will address topic areas for which there is a great and ongoing need, and will be easily accessible to clinical teams in their workplaces via the Web. The OERs will ultimately benefit patients, because they focus on improving the quality of care delivery. Beyond Distance is proud to be one of the institutions at the forefront of the OER movement in the UK, raising the profile of not only the University of Leicester but also of UK Higher Education in general, in the international Higher Education market.